Renée Lamberet was born into a family of free thinkers on 4th October 1901 in Paris. In 1924 when she was a student she became an anarchist militant in the group around the magazine Les Temps Nouveaux (New Times) animated by Dr. Marc Pierrot. In 1928 she became a teacher of history and geography and later specialised in history. In the 1920s she learnt Spanish and had a holiday every year with a family at Lleida in Catalonia, where she learnt flamenco guitar whilst her sister Madeleine took up painting there. She collaborated with the anarchist historian Max Nettlau notably with La Première Internationale en Espagne (1868-1888). During the Spanish Revolution she attempted with her sister Madeleine to cross the border only to be sent back both times. On the 1st September she obtained an authorisation from the revolutionary committee of Seu D’Orgell to stay in a collectivised hotel and gather documents on the collectivisations. Having been notified that she had got a job as history teacher at the Lycee Jules Ferry she returned to Paris. There she immediately got in touch with Nicolas Faucier (see his biography here at libcom) who had set up a committee to support the Spanish revolution and became very active within it. Returning to Spain during the Christmas holidays she met the Mallorcan Bernat Pou Riera, Press and Propaganda Secretary for the CNT, at the Casa CNT-FAI in Barcelona and they began to live in free union. She began, thanks to Bernat, to receive a vast amount of documentation about the constructive work of the Spanish Revolution, at her home in Villeneuve Saint Georges. This included posters and leaflets as well as reports and eye witness accounts. In August 1937 she visited the collectivised mines of Cardona and Sallent and the agricultural collective of Balsereny. From June of the same year she had become involved in the work of Solidarité Internationale Antifasciste (SIA) which had been newly founded. This involved above all work with the children’s colony Spartaco organised at Ajentona by the rail union of the CNT and with the children’s colony of Llanca, which welcomed refugee children from the Basque country, Asturias and the Madrid front. At the same time she contributed to the British anarchist paper Spain and The World edited in London by Vernon Richards and Dr. Francesco Gallasso. She also contributed to the Spanish anarchist press like Solidaridad Obrera, Catalunya and Nuestro. With the collapse of the Spanish Republic, she played an important role together with Faucier in giving aid to the exiled anarchist militants interned in camps in southern France. During the Nazi occupation she tried to carry on the work of the French Federation Anarchiste on a clandestine level with Henri Bouyé (see his biography here at libcom), which involved secret meetings in the woods. With her sister Madeleine and with the veteran May Picqueray she took part in counterfeiting documents for the resistance in a workshop set up by the Spanish anarchist Laureano Cerrada. After the Liberation she played an important role in re-establishing the Federation Anarchiste together with Bouyé, Roger Caron, Maurice Joyeux, Georges Fontenis, Maurice Fayolle, etc. With Caron, Bouyé, Giliane Berneri and André Senez and others, she contributed to the pamphlet Les libertaires et le problème social which appeared in April 1945. She served on the national committee of the Federation Anarchiste and contributed to its weekly paper Le Libertaire. Working on the international secretariat of the Federation Anarchiste, she was one of those who organised the international anarchist conference that took place in February 1947. She also chaired the commission to support Bulgarian anarchists who now suffered repression from the Stalinists. She joined the French CNT during 1947. At the same time she continued her work as a historian, interviewing many survivors of the Spanish Revolution. In 1949 she was one of the founders of the Institut Français d’Histoire Sociale (French Institute of Social History-IFHS) along with, among others, another noted anarchist historian Jean Maitron(she donated all her archives to the IFHS shortly before her death). At the start of the 1950s the Spanish CNT in exile was able to re-issue the record Hijos del Pueblo/ A Las Barricadas thanks to Renée, who had a pristine 78 rpm record of the original brought out during the Spanish Revolution (I first heard the record played by Miguel Garcia at the Centro Iberico in London). 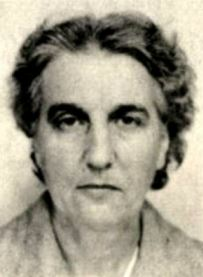 In 1951 she was a member of the Anarchist Studies Commission (CEA). This group opposed itself to the tendency around Georges Fontenis which gained control of the Federation Anarchiste at its May conference that year. From 1953 to 1956 she was the secretary of the International Workers Association (IWA-AIT) and edited its bulletin between 1953 and 1954. During the late 1960s she was close to the Union Federale Anarchiste (UFA) founded by Bouyé, Louis Laurent and René Lechainche. She also contributed to Liberté edited by Louis Lecoin and to Le Réfractaire edited by May Picqueray. At the same time she continued her work of compiling books on anarchist and working class history, not least the massive Mouvements Ouvriers Et Socialistes and an annotated edition of Nettlau’s The First International in Spain. She began to prepare a biographical dictionary of anarchists which was not completed due to her death. In 1975 she participated in the work of the Anarchist Poetry Seminar at the University of Paris. In 1979 she attended a conference on the Spanish Civil War in Barcelona. She helped examine the archives of the CNT and the FAI at the International Institute of Social History in Amsterdam. She died of cancer on March 12th 1980 at the hospital at Villeneuve Saint Georges.